As the Confederate invasion into Kentucky unfolded, a handful of Union soldiers under Major General William “Bull” Nelson were defeated at Lexington, Kentucky. Nelson’s Union forces represented the last true semblance of Northern might between the Confederate forces and Ohio. The Union high command, along with federal and state governments, recognized the horrifying possibility of a Confederate invasion of Ohio. Ohio Governor William Tod issued a call for minutemen to assist in the defense of Cincinnati; the point on the map where Confederate forces in Kentucky seemed to be converging. Union Major General Lew Wallace was put in charge of the city’s defense. Wallace ordered freshly mustered Ohio Infantry regiments, with no combat experience, from nearby Camp Dennison to Cincinnati. When residents of Cincinnati awoke on September 3rd, their town had become an armed camp. As numerous “Squirrel Hunters” and Ohio Volunteer Infantry regiments swarmed to the Cincinnati area, Northern numbers swelled against the few thousand Confederates under the command of General Henry Heth. 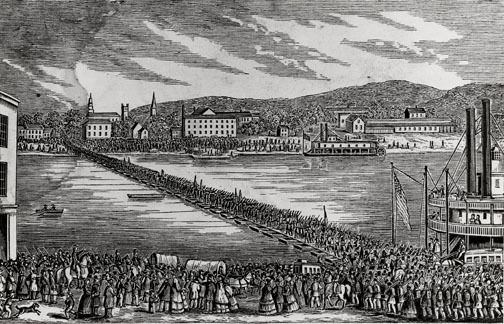 Heth’s own scouts reported over 70,000 defenders faced them in Cincinnati and in the entrenchments dug in Covington, Kentucky.15 Nearly 140 men from Oberlin, Amherst and Pittsfield left the Oberlin depot in the first days of the crisis well stocked with “fifteen barrels of substantial food-meats, bread, cheese” provided by the citizens of Oberlin. When they arrived in Cincinnati, the Lorain County men were given a dinner by a Mrs. Williamson, a resident of 3rd Street in the city. They stayed the night in her yard. As the next day began, the Lorain County men began to sing and were soon serenaded by a group of young ladies themselves. The men were soon organized into a company in which they elected W.M. Ampt their Captain. The company sent about 5 miles west of Cincinnati where they guarded a ferry crossing on the Kentucky side of the Ohio River.16 While encamped, the men drilled and went on picket duty. They mainly ate crackers and bacon. Aside from a brief engagement near Covington on September 10th, the Confederate threat to Cincinnati had very little teeth. The Lorain County men did not see any action while they were encamped along the river. 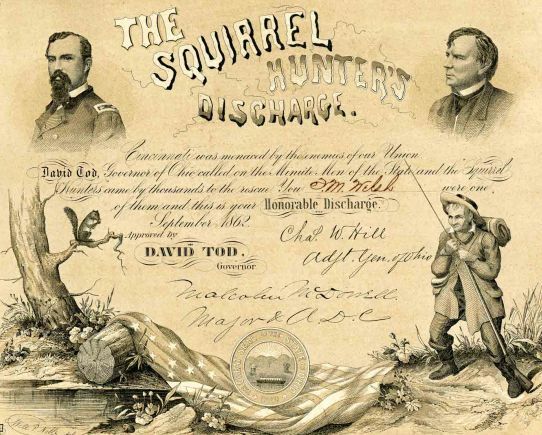 The Squirrel Hunters were instrumental in denying Cincinnati to General Heth’s Confederates, thus turning them back deeper into Kentucky to fight General Buell’s men. In this way they were also helpful in getting the Emancipation Proclamation issued. Historians have held that the fate of the Emancipation Proclamation was contingent upon General McClellan’s success in blocking Lee’s intrusion into Maryland. But one can imagine Lincoln would have been hard pressed to issue the Proclamation had one of the Union’s major cities been sacked by Confederates who seemed able to strike at the North with impunity. 1James McPherson, Battle Cry of Freedom, (New York: Oxford University Press, 1988), 516-517. 2Lorain County News, "Home Guards", May 1, 1861. 3Denton J. Snider, A Writer of Books In His Genesis: Written for and Dedicated to His Pupil-Friends Reaching Back in a Line of Fifty Years, (St. Louis: Sigma Publishing Co., 1890), 164. 4Whitelaw Reid, Ohio in the War: Her Statesmen, Generals and Soldiers, Volume I, (Cincinnati: The Robert Clarke Company, 1895), 130. 5Lorain County News, “Making Ready”, September 3, 1862. 8Oberlin College Archives, Record Group 21, Series: II Letters, Subseries: A Oberlin Students Box#1. Sarah Merion to Parent and Sisters. 9James Harris Fairchild, Oberlin: The Colony and the College, 1833-1883. (Oberlin: E.J. Goodrich, 1883) 169. 11Oberlin College Archive, Record Group 21, Series: II Letters, Subseries: A Oberlin Students, Box#1, Sarah Merion to “Respected Sister”. 12Oberlin College Archive, Record Group: 21-Oberlin File, Series: II Letter, Subseries: A By Students 1858-1886, Folder: Letter-“Fannie” to “Dear Sister”, Box# 2. 13Oberlin Evangelist, “The Dark Future and its Causes”, October 10, 1862. 14Snider, 160; “Fannie to Sister", Sept. 10, 1862. 15David E. Roth. “Squirrel Hunters to the Rescue.” Blue and Gray Magazine April/May 1986. 20 April 2012 www.cincinnaticwrt.org/data/panic.html. 16Lorain County News, “Oberlin Astir”, September 10, 1862. 17Lorain County News, “The Oberlin Minute Men”, September 24, 1862. 18Oberlin Evangelist, “The War”, October 8, 1862.